Tasted at a blind-tasting this showed its hand as a mature Burgundy on the nose despite having a good consistent medium red colour. Initially the nose was closed but then released old manuscript, raspberry, medicinal, quartz and dried cherry aromas. Ripe cranberry, red cherry and textured. Drying out but still decent and enjoyable. Intriguing range of aromas which continued to evolve over an hour. Interesting although not quite fascinating. Scores 72/100. 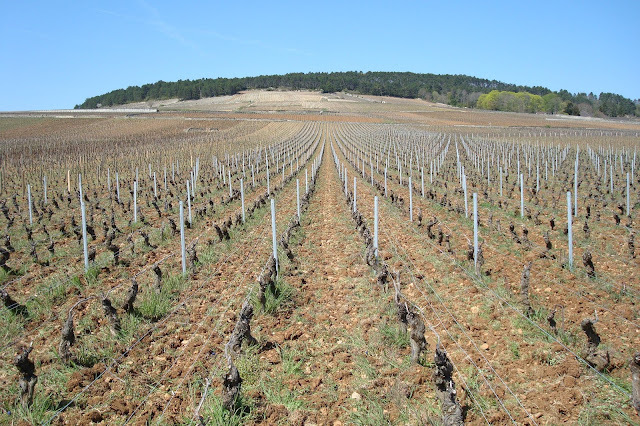 Photo shows the full slope of Volnay from the bottom of the Cote in April 2009. Great things happened after this shot was taken!